The best flagstone for you: natural cleft, thermal, or honed? I don’t make any secret of the fact that I prefer natural stone to pavers, segmental wall block, or lick and stick stone. “Flagstone” can mean a pretty diverse array of stones and finishes, so which is the best flagstone for you? If you’re driving around Virginia, oohing and ahhing over beautiful landscapes like the one we created for Old House Vineyards, odds are that you’ve seen a lot of blue- and gray-toned patios and walks (with occasional pops of rust, gold, green, and purple). This is most likely a product known as Pennsylvania variegated flagstone, quarried just two states north of here. It’s a durable stone that cuts well and looks terrific with all different styles of landscape design. That’s what I’m going to discuss here. There are plenty of other colors available – check out these Tennessee browns below – but we use a LOT of Pennsylvania variegated flagstone. We use it in a few different finishes. Also a note: this post is talking about the surface finishes of slabs. Check out this post to learn about flagstone edge treatments. Now, Geology 101 was a long time ago, and it was my first 8 am class ever in college, so I don’t remember as much as I wish I did. What I do know is that flagstone is a sedimentary rock, made up of lots and lots of layers compressed together over thousands of years. Think of puff pastry dough. Natural cleft flagstone is cut to thickness (typically 1-2” thick) by using a hydraulic guillotine to split it along the grain. In other words, it’s cleft. Naturally. This is amazing writing, y’all. What this means in terms of finish is that 1) the thickness can vary from piece to piece, 2) each piece may have thickness variation along it, and 3) each piece can have a finish that ranges from sort of smooth to very uneven. Natural cleft flagstone is probably the most commonly used type of PA flagstone, and it’s the least expensive of the three types discussed here. 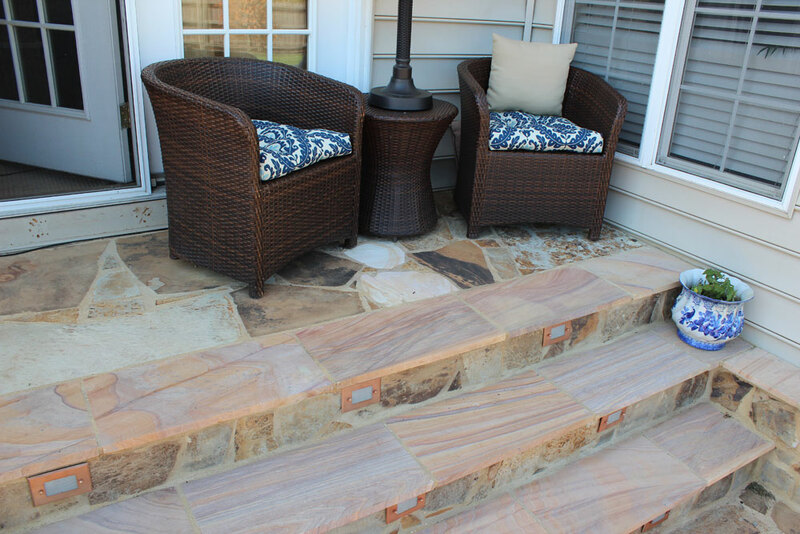 It’s an excellent choice for patios and walks, but it’s not ideal for step treads, wall caps, or counters. For thermaled flagstone, the slabs are generally sawcut into uniform thicknesses. The slabs are then heat treated (thermaled) in a kiln, or can be done in the field using an oxy-acetylene torch. Either way the method is the same: the surface of the stone is wet down, and then heat is applied. As the water turns to steam, it pops off irregularities in the surface, resulting in a much smoother, dimpled finish. Front walks – nowhere is a smooth, consistent surface more important than the main entry to your home. Keep Aunt Edna safe! We also specify thermaled flagstone for commercial projects for the same reason (especially our winery clients). Step treads and wall caps – every time I see a wall cap or step tread done with thin, natural cleft stone, all I can think is “oh bless their hearts they didn’t know any better!” Step treads and wall caps (and windowsills and hearths and mantles and so on) look 1000x better at a minimum thickness of 2”. They just do. Second, steps, etc look better if all pieces are the same thickness. Third, the thermaled top and edge (or a rockfaced edge) give the project a more finished look. Don’t take my word for it. Look at the two photos and see which looks better. This was a new one for me this year, and I absolutely love it. Slabs are sawcut to uniform thickness, much like thermaled flagstone, but the surface is honed. That means that the entire surface is ground to a smooth, flat, consistent finish. It looks amazing. I like to use honed flagstone for surfaces that are going to receive skin contact. That can be firepit caps, hearths, outdoor kitchen worktops, and the like. It just feels so cool that I love using it! Just keep in mind that because it’s so smooth, I don’t think it would be a good choice for steps. If I’m wrong about that, feel free to tell me I’m an idiot in the comments. Armed with this information, do you feel like you know it all? Or do you want the help of a stone-obsessed, plant lovin’ landscape design geek to make your landscape absolutely amazing? All you have to do is contact me to get the ball rolling. I can’t wait to hear from you! As a natural cleft Pennsylvania bluestone quarryman, I can assure you that we do not have hydraulic guillotines splitting our stone for us lol. The only method to split natural cleft is with hammer and chisels, along with a good eye and a strong back. It may seem like a small detail, but it’s a crucial part of the process and a time honored tradition in my neck of the woods.